You don't need to be a member of HWA to apply for any of our scholarships. We also offer a Young Adult Write Now Endowment Fund for libraries. 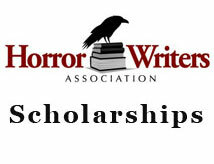 For more information on any of our scholarships and to apply, please visit HorrorScholarships.com.